A light shifty breeze greeted sailors who spent most of the morning driving through gale force winds for the GUL RS600 Inland Championships, sharing the course with 300, 400, and Vareo's. After a recall due to a large wind shift, we get off the line and pick our way up wind in very patchy winds. Pete Nelson round’s the top mark first, followed by John Charles and Calum Terry. Pete draws out a modest lead on the other boats, the rest of us stay close. John and Calum start to claw back Pete and in the final part of the race Calum finds himself grabbing a first, not a bad start for his first event in his 600. Pete is second and John third. 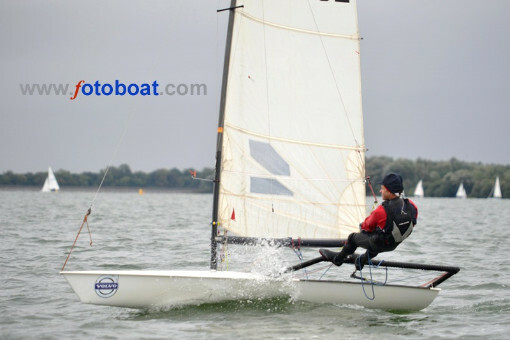 Second race of the day was started but the wind went to nothing and we were eventually sent back to shore. A stiff breeze welcomed us for day two, but this was thought to be a bit too much so we had to wait for it to drop off a bit. Eventually the flag comes down and we are allowed to go play. Pete shoots off the line with John and Tom Powell. Pete is at the top mark first whilst Chris Tilbrook and John fighting it out for second. Pete takes the win, John loses his second place at the bottom mark so Chris in second and John in third place. For race 3 the first beat is close with Tom showing good pace. Pete is at the top mark first with Chris on his tail. John went up the far right but the wind shifted against him leaving a lot of catching up to do. Pete grabs another first,Chris second and John manages to fight back to third. Again everyone stays close for race 4, Pete is up front but Chris and John keep close, and on the down wind leg Pete loses the lead for a while; this does not last long and he's soon back for another win with Chris second and John third. Well done Pete Nelson who wins this years GUL Inland Championships!